When you need a new name and you need it fast, you need 'Alias'. Need an alias for a restaurant reservation? Want a false name you can give to strangers? Have to give your interrogators a name, but don't have one? 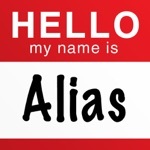 Don't worry, you've got Alias! Alias quickly generates a random name from 500 million possible names. You can easily generate female names, male names or a completely random name.